Garden strawberries (Fragaria x ananassa) are an easy-to-grow fruit that will reward the home gardener with ample harvests for many years. With favorable conditions, each strawberry plant should produce one quart of strawberries per season. Garden strawberries produce their fruit in the late spring and early summer months, though it can be earlier in the warm, southern states. The garden strawberry, which is typically referred to simple as a "strawberry," are a hybrid species from the genus Fragaria. It was first bred in the mid-1700s in France by crossing a North American strawberry, F. virginiana, and a Chilean strawberry, F. chiloensis. Technically speaking, the strawberry isn't a true berry but rather an aggregate accessory fruit. Strawberry plants in zone 6 and farther north should be planted outside during the spring months in order to be well-rooted by the following winter. Garden strawberries planted in Zone 7 and farther south can be planted in the fall. Space the plants 18 inches apart, as they will shoot out runners quickly. Garden strawberry plants ideally need 8 hours of full sun per day but can be planted anywhere that gets between 6 to 10 hours of sunlight daily. Garden strawberry plants prefer soil that's slightly acidic with a pH of 5.8 to 6.2. Plant the strawberries so that the roots are covered in soil but the crown is exposed to fresh air and light. If buried deep, the plant will rot. Mulch between plants after planting to keep the soil temperature cool, deter weeds, and to keep the fruit off the soil. Straw is the traditional strawberry mulch. Do not use black plastic since it will raise the soil temperature and optimal fruit production requires cool soil. In colder climates, mulching over the strawberry plants in winter will prevent injury to the crowns. Wait until the temperature drops to 20 degrees Fahrenheit. and cover the bed with several inches of straw or pine needles. Be sure to use a mulch that can be easily removed in the spring. Once again, straw is an ideal option. Shredded leaves also work well. For juicy strawberries, provide 1 to 2 inches of water per week. Regular watering is especially important while the fruit is forming, from early bloom to the end of harvest. The ideal temperature for garden strawberries is between 60 degrees and 80 degrees Fahrenheit. However, the plants can tolerate temperatures as low as 22 degrees Fahrenheit, as long as the plant is protected from frost. The plants will die at temperatures of 10 degrees Fahrenheit or lower. High humidity might encourage the development and spread of powdery mildew, so provide plenty of air circulation for the plants. Start with rich, organic soil, and apply a balanced fertilizer (10-10-10) at planting time, at the rate of 1 pound per 100 square feet. Fertilize again after renovation of June bearers or the second harvest of day neutrals and everbearing types. Do not over-fertilize, or you will have excessive leaf growth and poor flowering. Additionally, don't fertilize strawberries late in the season in colder climates, as you want to prevent new growth that will be damaged by frost. Strawberry plants are grouped by their fruiting habits. Be sure you know what you are planting because the type of plant will determine when and how much you harvest. June-bearing: This variety produces one large crop per year during a two- to three-week period, usually around June, though there are early, mid-season and late varieties. Everbearing: These strawberries do not continually bear fruit, as their name might imply. Everbearing strawberries produce two to three harvests of fruit intermittently during the spring, summer, and fall. Day-Neutral: These strawberries produce fruit throughout the growing season, but in smaller quantities than June-bearing plants. Everbearing and day neutral strawberries are great when space is limited. They have a longer season of harvest, but the fruits are usually somewhat smaller than June bearers. June-bearing strawberries produce a number of runners, while Everbearing and Day-Neutral varieties only produce a couple of runners. For the most fruit, keep each plant at three or fewer daughter plants each summer, clipping off the remaining runners. During the first year, pick blossoms off the plants. If you don't allow the plants to produce fruit during that first year, the yield will increase significantly in the second year because the plant spent the time developing healthy roots instead of fruit. 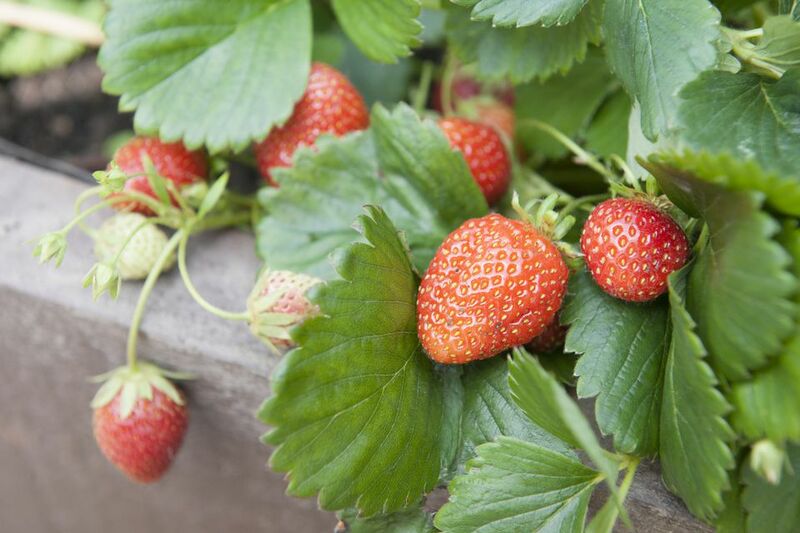 Garden strawberries will begin to produce fruit over a period of about three weeks in the late spring, though the fruit will appear earlier in warmer climates. Strawberries are the sweetest when fully ripened on the plants. For most varieties, this means leaving the berries on the plant for a day or two after they are fully colored, though the only way to know for sure is a taste-test. Strawberries bruise easily, so be gentle when pulling the fruit from the plants. Snap or cut the stem directly above the berry rather than pulling on the berry itself. Keep harvested berries in a cool, shady location. If you don't have outdoor space for a garden or if you live in an area with soil is naturally alkaline, it might be a good idea to grow garden strawberries in a container that's full with compost-enriched quality potting soil. Garden strawberries grown in containers can be replanted in the late summer months. Move them to a cool, protected place, like an unheated basement or garage, during chillier months.